TOKYO - Prime Minister Shinzo Abe and his ruling party came under fire from opposition parties Tuesday for holding a social gathering last week when warnings were issued in western Japan for torrential rains that developed into one of the worst natural disasters in the country in decades. The private party held by Liberal Democratic Party members on Thursday was also attended by Justice Minister Yoko Kamikawa, who two days earlier ordered the executions of AUM Shinrikyo cult founder Shoko Asahara and six of his followers for a series of crimes including the 1995 Tokyo subway nerve gas attack. The executions of the seven death row inmates were carried out the day after the gathering. The torrential rains that devastated southwestern and western Japan have left over 150 people dead, with dozens still missing. The party drew attention as some of its participants posted photos and descriptions of the cheerful gathering on social media. Opposition parties lashed out at Abe and the LDP, with a senior official of the main opposition Constitutional Democratic Party of Japan saying the around 50 LDP members at the gathering were irresponsible. "It was the night the meteorological agency was issuing warnings. I never thought (ministers) would do such a thing," said Renho, the CDPJ's House of Councillors secretary general, who viewed Defense Minister Itsunori Onodera's attendance as particularly problematic given his role in overseeing Self-Defense Forces rescue operations. Liberal Party President Ichiro Ozawa said, "It shows (the LDP members) do not attend to their duties from the viewpoint of protecting citizens' lives and livelihoods." Chief Cabinet Secretary Yoshihide Suga defended Abe and other participants, claiming the prime minister's office was "properly responding" to the disaster that caused widespread flooding and landslides. LDP officials have said it was difficult to foresee the impact of the rain at the time of the gathering, and there was very little information about whether disasters were occurring then. 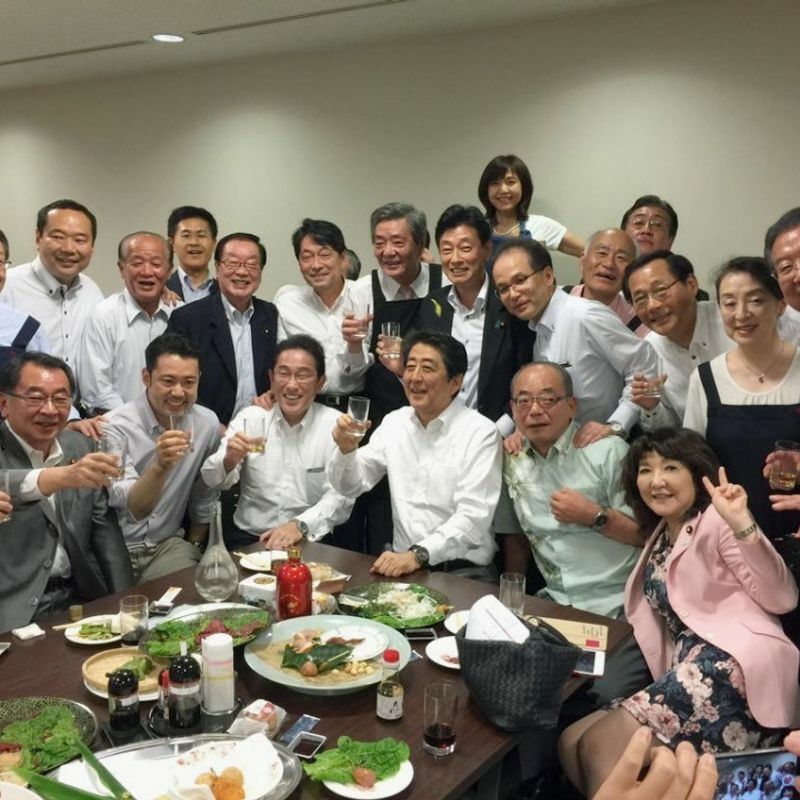 The party has been held regularly and Abe attended it for the first time in a move apparently aimed at garnering support in the run-up to the LDP leadership election in September.